Astonishing DC Charter Bus Rental Service at Affordable Prices! 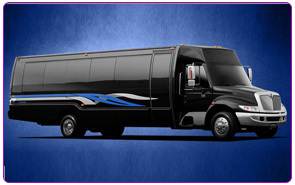 Party Bus Dc rental provides a reliable bus rental DC for your all group transportation needs. Our expertly trained professional drivers have several years of experience when it comes to safely operation charter buses. 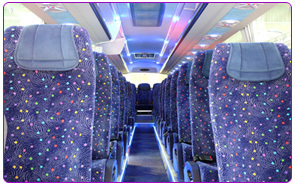 Unlike many other Bus Rental DC or charter bus rental companies in Washington DC. We work with our clients so everyone has a solid game plan. And your ideal transportation goals and ideas are met. We can work together to create a schedule and find the perfect charter bus in DC to suit your needs. Even if you decide to change your plans. Our chauffeurs are familiar with the area and each bus is equipped with top notch GPS. Providing flight tracking on all airport pick-ups! You can literally take our services anywhere that you may need them. We have a large charter bus rental DC. We can use for incoming and outgoing flights. We can even provide multiple vehicles at once in all varieties. We cater to meetings, events, conferences, seminars. And banquets as well. Providing guests with an exceptional means of transportation. And we can assist in providing the reputable image that your company wants to maintain. Within our huge fleet of well-maintained vehicles, we are sure that you will find exactly what you are searching for. We provide large DC charter buses for standard travel, buses for long distance; some of which have separate sleeping compartments, and others with large sleeping suites. We offer DC limo rental & DC charter bus rentals with flat screen TV’s and DVD players, and our mini buses are fitted with premium leather seating and flat screen TV’s per each seat. 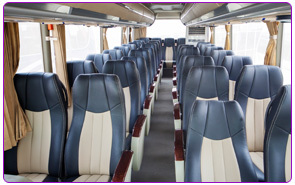 Relax in plush cushioned seats with comfortable backrests in our luxury motor coaches. We even offer party buses for special occasions. Experience high end benefits from a prestigious transportation company that offers great low rates! As a charter bus company that has been in the Northern VA and DC area for decades, we try to anticipate the needs of our clients. That’s why we offer quick billing and detailed receipt. So there will be no surprises. And you can keep things moving along as scheduled. We also realize that every company and person is unique. And may require different needs. Because of this we are always open to special requests. We have made birthdays, retirement parties, museum visiting, and tours extra special with our accommodations. Let us know if you have something in mind, we would be happy to help. If you have any further questions. Please contact our friendly team of representatives located right here in northern VA. They can tell you more about our knowledgeable chauffeurs who are familiar with the surrounding areas, our package deals, or help you decide what charter bus rental is best for you and your occasion. Create DC Bus Tours that will get People Talking! Our company has a large immaculate fleet of charter buses, tour buses, mini buses, motor coaches, and much more. You are guaranteed to find exactly what you are looking for. All of our vehicles are taken care of and regularly inspected. Each bus is equipped with modern amenities and some are even specifically designed for DC tours with an overhead intercom system. 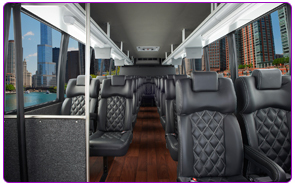 As the tour guide speaks of Washington’s history and accomplishments, guests will be sitting within premium plush or leather comfortable seats; all spacious and spotless. We take pride in our luxury vehicles, because we know how disappointed a DC newcomer would be trying to learn of its wonderful culture and history through the squeak of old brakes, or gazing at the architecture through scratched or dirty windows. When you use our services, you can be assured each bus is in great condition. Providing comprehensible detailed billing, so there will never be any surprises. All of our chauffeurs are familiar with the best routes in Washington DC and the northern VA area. They are also knowledge when it comes to not only directions, but some of the best museums, restaurants, local history, and more. For a DC charter bus rental & charter bus DC will love, select our on-time services. You can rely on us always for on time or even early arrivals. This makes our transportation service great for airport pickups. 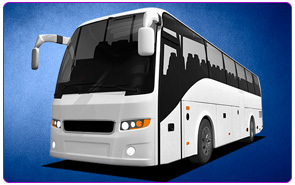 We have large charter buses capable of making airport transfers a breeze. Our educated chauffeurs always use flight tracking, so if your plane schedule changes, our timely service won’t. For very large group transportation and pickups, we can extend several charter buses and polite chauffeurs at once. No group is too large; we always have drivers on standby, on call, and have a large team of friendly professionals that are prepared to help make your transportation experience one-of-a-kind. We are an organized transportation company, but that doesn’t mean that sometimes plans don’t change. If you have created a schedule for our driver, but then decide to vary it up a little bit; that’s perfectly okay with us. We easily adapt to changes in schedule and since our drivers are familiar with the area, it will be no problem getting everyone there safely. So if you are searching for a reputable company to create fantastic tours, go with us. We are accommodating and always tailor our services to the specific event. Let us know if you have any special requests and we will gladly help you. Call today to learn more about our large fleet of charter bus, friendly drivers, and on time service!